With the news of Josh Lewsey's international retirement, we take a look at where his fellow World Cup winners have ended up after their moment in the sun in Sydney five years ago. Josh Lewsey: Continued as an important part of the Wasps and England set-up until announcing his retirement from international rugby in December 2008. Scored the try that saw England past France and into the 2007 World Cup final, but injury ruled him out of his second final and he was subsequently left-out of Brian Ashton's squad for the 2008 Six Nations. Lewsey was retained by Martin Johnson in his first Elite Player Squad, but a dip inform saw his place taken by Delon Armitage. Jason Robinson: Hung up his international boots in 2005 after touring with the Lions, but was coaxed out of retirement by Brian Ashton before starring in England's run to the 2007 World Cup final. Made his final international appearance for the Barbarians against South Africa before giving up the game for good at the end of the 2007-08 season, retiring to his family's farm. Mike Tindall: Made the switch from Bath to Gloucester and became an important leader for England before a broken leg ruled him out of the 2007 World Cup. Tindall suffered a torn liver and punctured lung in a freak collision with Wales full-back Lee Byrne in their Six Nations match at Twickenham in February 2008. Upon his return to fitness Tindall signed a new deal with Gloucester, but found himself demoted into the England Saxons squad by new boss Martin Johnson. Ben Cohen: Cohen experienced a dip in form after the World Cup, admitting that his appetite for the game had slipped. Toured with England in 2007 with a view to the World Cup, but then ruled himself out of the tournament to spend time with his pregnant wife. Sought release from his Northampton contract upon the club's relegation in 2007, moving across the channel to play for Brive in the Top 14. Jonny Wilkinson: Endured years of injury misery since his drop-goal won the World Cup. Three separate shoulder injuries, a lacerated kidney, neck problems, adductor muscle and appendix issues and most recently a dislocated knee cap suffered while playing for Newcastle against Gloucester in September 2008 have kept him from the world stage. Wilkinson originally returned from injury in time for the 2005 Lions tour and played an integral role ain England's run to the 2007 World Cup final after recovering from further injury problems. Matt Dawson: Moved to Wasps from Northampton before retiring from the game to pursue his media interests. Came second in the BBC's reality dancing show Strictly Come Dancing behind cricketer Mark Ramprakash before winning Celebrity Masterchef. Occasionally commentates on rugby for Radio Five Live and presents a fishing show on UKTV Food. Trevor Woodman: Forced to retire due to a back injury sustained in training in 2005, having moved from Gloucester to Sale in 2004. Currently scrummaging coach with Sydney University after heading down-under when his career ended. Steve Thompson: Forced to retire on medical advice after damaging his spinal cord in 2007, but was subsequently passed fit to return to action. Thompson took up a contract with French Top 14 side Brive, alongside former Northampton colleague Ben Cohen. Phil Vickery: Captained England under Brian Ashton and won a Heineken Cup with Wasps after making the switch from Gloucester in 2006. A series of back injuries have disrupted Vickery's international career since the World Cup, but he was the only member of the 2003 side on display against Australia in the 2008 autumn internationals. 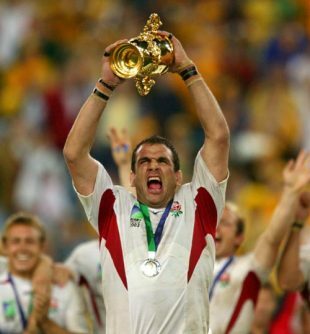 Martin Johnson: England's talismanic skipper is now the man in charge at HQ after taking the reins as England manager in April 2008. Still a hugely influential and popular figure, Johnson has endured a difficult start to his tenure with England slipping the heavy defeats against the Tri Nations sides in the 2008 autumn internationals. Ben Kay: Still packing down for Leicester Tigers and was an ever present during England's run to the 2007 World Cup final. Kay was called into Martin Johnson's 2008 autumn international squad as injury cover but did not feature. Richard Hill: Battled on for Saracens until May 2008 when a knee injury ended his career. Put in an outstanding, grafting display to help Sarries defeat the Ospreys in the 2008 Heineken Cup quarter-finals. Now mentors young Saracens players part time whilst working as a business development manager. Neil Back: Toured with the Lions in 2005 aged 36 before joining the coaching staff at Leicester. Has since moved on to become Head Coach at Leeds, and his side are currently unbeaten in national Division One this season. Martin Corry: Skippered England through a rough patch in the 2005 and 2006 Six Nations before retiring from international rugby following the 2007 World Cup. Corry currently captains Leicester Tigers and has moved into the second-row in recent seasons. Lewis Moody: Recently returned to action for Leicester following a long-term layoff with injuries to his hip and Achilles. Will be back in the England reckoning for the Six Nations but faces tough competition from Wasps' Tom Rees and Bath skipper Michael Lipman. Kyran Bracken: Retired from rugby in 2004 after a long-term back injury. Won ITV's reality show Dancing on Ice and now works as a professional ice skater. Mike Catt: Catt soldiered on through England's run to the 2007 World Cup final before his controversial autobiography brought further scrutiny on Brian Ashton's tenure as England coach. Currently employed as London Irish's attack coach after a successful time with the club as a player. Iain Balshaw: Moved from Bath to Leeds before settling at Gloucester. Started all of England's 2008 Six Nations matches but drew a great deal of criticism for some inconsistent displays. Balshaw was subsequently left out of Martin Johnson's Elite Player Squad and Saxons squad.